re: Avengers: End Game (5/3/19) D: The Russo Bros.
Looks like they're cheapening out on the Infinity Gauntlet. Marvel Studios' decision to withhold the official title of Avengers 4 was done in an attempt to keep the spotlight focused on Infinity War, but it hasn't quite worked out like the studio had planned. Speaking to IGN at the Avengers: Infinity War press day, Marvel Studios president and producer Kevin Feige said he's "not sure" when the official title of Avengers 4 will be revealed, as they "haven't decided exactly" when to announce it to the public. A few weeks ago, directors Anthony and Joe Russo teased that fans should be scared by Avengers 4's title. Feige continued: "I've said before, it's gotten entirely out of hand. And now will have no chance to living up to any expectations of what it's gonna be. And it sort of backfired, if I'm honest with you, because the notion was to not talk about it so the focus was to be on [Infinity War]." He then went on to explain the reasoning behind the studio's decision to wait to reveal the title, pointing out how the announcement of Infinity War Part 1 and Part 2 before Age of Ultron was released stole a bit of the spotlight from the second Avengers movie—even though it still ended up being a huge success. "I think there was a slight notion of—Ultron hadn't come out at that point and I felt a tiny little sense of, 'Well, gosh, we've gotta talk about the movies we have coming out next because that’s what we’ve been working so hard on and that’s what’s next available for our audience to see,' but when we talk that far ahead, that took a lot of attention out," he said. While Avengers 4 won't be subtitled Infinity War 2, Feige stressed that Infinity War and Avengers 4 are closely connected. "They’re absolutely directly connected, as many of our movies are but more so than many of our other movies," he explained. "People will want to know what happens next immediately at the end of it." What's "pulling a Zach Snyder"? That Hulk looks like a mix between the main character from Dark Crystal and Hulk. lol! 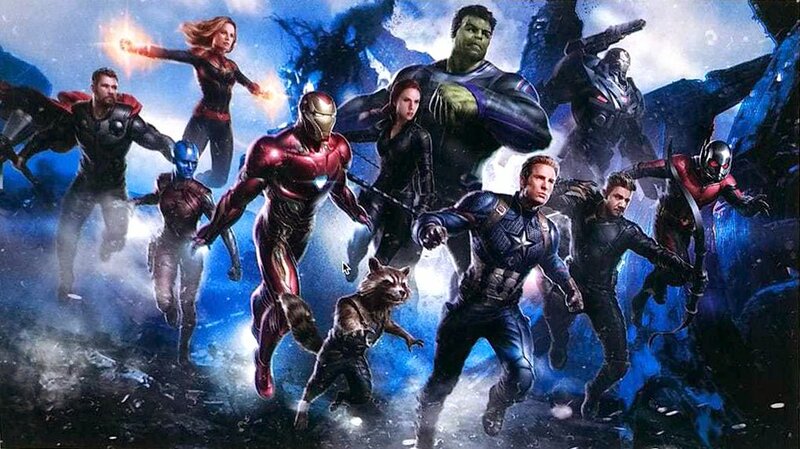 looks like bad fan art to me, especially hulk. I recall other leaked art has been of a similar style, so it could be accurate. And it's everyone that survived Infinity War, I think. That was my thought as well. And no Black Widow? I saw that over the weekend, but End Game would be a pretty boring title. I really hope that's not it. Unless the Taylor Swift song is the theme for Avengers 4, then it would be AMAZING! I'm more interested in this Chappie movie listed above. What can you tell me about that? I wasn't sure if you were serious but here's the thread. Set photos from the current Fall reshoots. This artwork may be legit, after all. Hi-Res versions have begun to appear.